It seems fall is really here. The mornings have been clear and crisp. I’ve run the fireplace twice now. The geese and grackles are flocking. And the red squirrels are furiously stashing food for winter. My plan had been to write a post about all of the amphibians and reptiles that came to visit this summer, but that’s going to have to be a later post. As it turns out, one creature really stole the spotlight. This summer opened and closed with the March of the Snapping Turtles. We had them in the front yard, the back yard, under the house, in the lake, everywhere. All looking for a suitable place to lay eggs. And all probably frustrated by the fact that we plopped a house down right in their path. But they worked around it. This one went down and over our septic tanks. And for this video, I need your help. What is the bird you can hear at the :02, :07 and :13 mark? It sang every morning and evening all through early summer and I never could track it down. This girl excavated our driveway for three solid days. The weather was hot and dry and she seemed to move slower each day. I couldn’t tell if she was actually laying eggs. It seemed she was never happy with the holes she dug so after an hour or so of digging, she’d move and start a new one. Then, at the end of an exhausting day of digging, she’d drag herself back to the lake. Every day for three days. Ok sure, so that’s a bit anthropomorphic, but I’m telling you, she really did get slower and slower. I was worried about her. We finally decided maybe the gravel was too hard-packed for her, so we dug out a small area and replaced it with sand, then tried to block her from traveling farther into the driveway. Twenty minutes later she was through the barrier, apparently going between the rungs sideways like the Millennium Falcon. Only maybe not quite as fast. After that we didn’t see her again and I marked off the areas where she had dug her best holes. And look! Her hard work paid off. Here’s what we found just a couple weeks ago. Are those not the cutest things? All together, we found five of them in various places around the property. I wasn’t really sure what to do with them to give them the best chance at survival, so I asked a snapping turtle biologist on Twitter. Not a lot known of habitat needs over 1st fall and winter. I would pick closest permanent water with vegetative cover. I carefully placed each one in its own sheltered spot on the edge of the swamp. I figured it was the least I could do for dropping a house on their nesting grounds. Now presumably, if you hunt them, you eat them. But, it turns out, they are filled with environmental toxins, so you don’t want to do that. So why else would you hunt them? To sell the meat to people who see it as a delicacy? But that’s illegal. So why is it hunting snapping turtles even permitted? There’s no good reason. 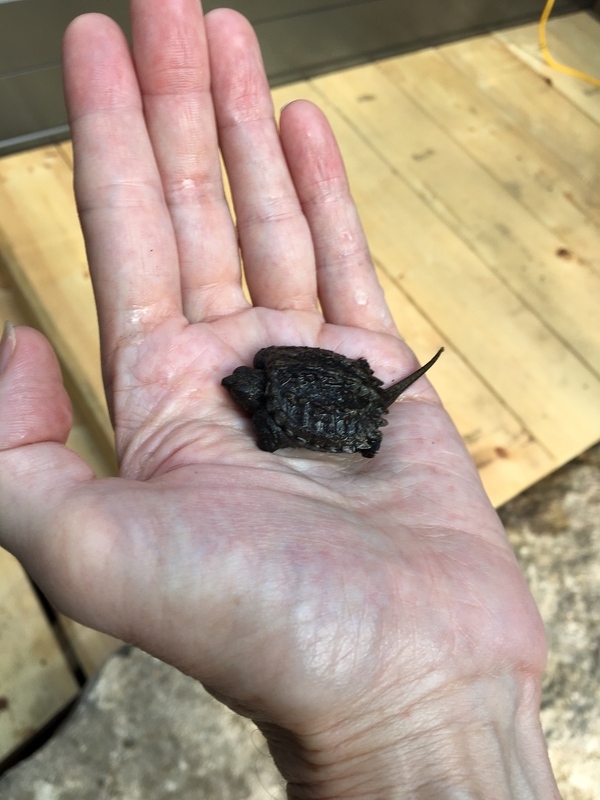 I blogged on that back in 2012: Ontario Snapping Turtles: Toxic Turtle Soup. So that was the story of our snappers. Next time I’ll introduce you to the frogs, toads, salamanders and snakes that also passed through Sweertfern this summer. Incredible! I’ve not yet had an opportunity to see a snapping turtle firsthand. One laying her eggs in your yard is something else. I live close to a lake, but the snapping turtles keep to the water, lurking. Wood thrush! Yes! I’ve never seen one here but now that I know what to look for, I’ll keep my eye out. Thank you!